So you want to learn how to crochet an afghan of any size? Crochet afghan patterns are simple in shape, a basic rectangle of crochet stitches, but modifying crocheted afghans can sometimes be anything but simple. 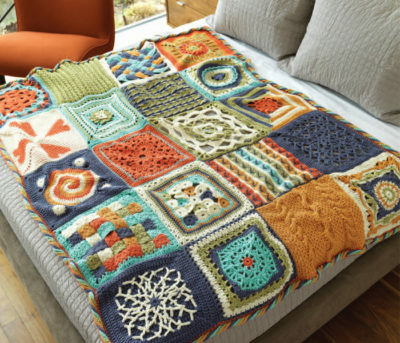 With no fit and rarely any shaping, crochet afghans are a perfect blank canvas for learning or playing with new techniques such as cables, Tunisian crochet, motifs, and more. There are three basic sizes for crochet blankets: afghan, lap blanket, and baby blanket. Traditionally, full-size, crochet afghan patterns measures about 50″ by 65″. The lap blanket is about 35″ by 40″. And the perennial favorite, the baby blanket, measures about 25″ by 30″. These measurements are just guidelines. Your crochet afghan’s size can be determined by your gauge, stitch pattern, or motif size. But what if you want to modify a baby blanket into a full size afghan or a large afghan into a crib size blanket? Easy crochet afghan patterns that are worked in stripes using a single stitch, such as the City Stripes afghan by Leigh Radford, are the easiest to modify. Use the gauge, in this case 11 single crochet and 14 rows equal 4″. This is 2 ¾ single crochet and 3 ½ rows equals 1″. So to create a crochet baby blanket, you would need to work only 69 stitch and 105 rows in the color stripe pattern. Crochet afghans that are worked in a specific stitch pattern or are created by joining motifs are constrained in size to the proportions of the stitch pattern or motif. The size of the Moorish Mosaic Afghan by Lisa Naskrent is determined by the main octagonal motif. This motif is 8″ wide and 8″ tall. The original pattern is 5 motifs wide and 6 motifs high. But what if you want to convert this crochet blanket pattern to a lap afghan size? Pull out your calculator. A configuration of 4 motifs wide and 5 motifs high will create a lap afghan that is 32″ by 40″. A baby blanket of 24″ by 32″ is easily constructed with rows of motifs 3 wide and 4 high. You can adjust the size of an afghan worked in a stitch pattern in the same way by working more or fewer repeats of the stitch pattern. 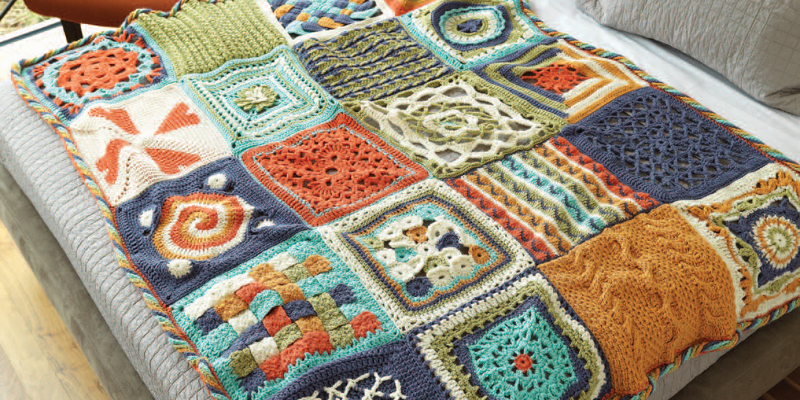 A crochet blanket like the Solas Caomh by Jodi Euchner that incorporates a pattern that is not consistent across the width or height requires some creativity to modify. To modify this crochet blanket pattern from a baby blanket to an adult size afghan, you have several options. You could simply increase the number of double crochet stitches between the cable bands or you could work more cables bands in any configuration you find pleasing. Another way to modify the size of an afghan is to substitute the yarn with a lighter or heavier weight yarn. A full size afghan like the Desert Sunrise by Carol Ventura in Unexpected Afghans, worked in worsted-weight yarn, can be modified to a lap afghan or baby blanket by working the pattern in a sport-weight yarn instead. Modifications in yarn weight and hood size mean the swatch becomes very important if you want to ensure your finished afghan is the correct size. Download or order your favorite crochet afghan patterns and learn how to crochet a blanket of any size today.